Raised high as if to reach the feet of mountain gods, carved defiantly into sheer mountain cliffs, the roads torturously rise and bend in narrow ledges to villages which sit high above the sparkling Tyrhhenian Sea. They lead from towns and villages, past villas and gardens, to yet higher stone hamlets with small churches and shrines. Lemons and olives bide their time patiently underneath the cold blue skies and glare of a midwinter sun. 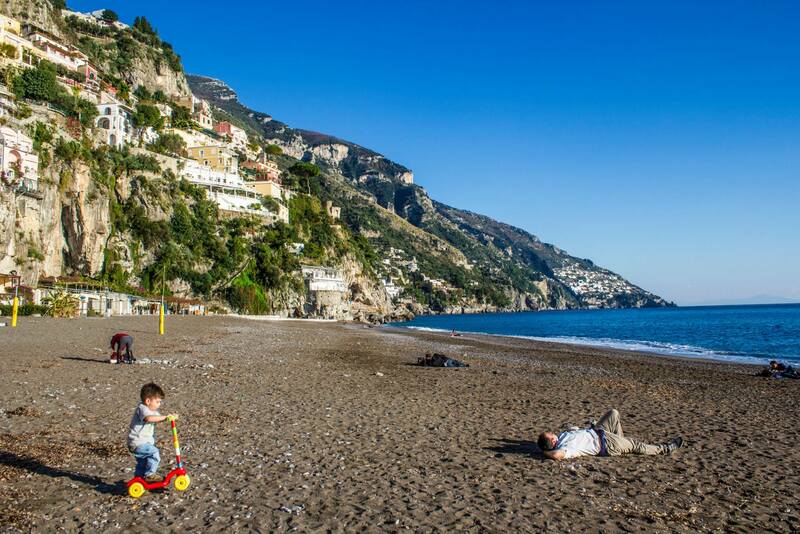 This is the quiet glory of the Amalfi Coast in December. The costa Amalfatina, the Amalfi coast, is the peninsular stretch west of Salerno, with the Bay of Naples generously bound along its north. The towns of Amalfi, Positano and Sorrento dominate the interest of travelers to this area, who invade in armies during the summer months. The photorealism here is as gratuitous as it is vivid: pebbly beaches vertically skirted by small pastel-coloured houses reached by steep staircases, the houses set out on the hillside like a giant cabinet of colourful drawers. In other places, sheer, cragged cliffs drop sharply into the sea beneath, sheltering dripping grottos and Italian nativity presepi: ghoulish, tiny figures of the Holy family and pastoral life brought alive by mechanical action. The Amalfi lemon is revered in tiles, bottles, plates and ceramic – the yellow set among the brilliant blue of the sea dominates aesthetics – and locally made Limoncello dominates markets and graces the menus of restaurants, sitting nicely in dishes both savoury and sweet. The hamlet of Nocelle, a stone, high-walled village, far above the town of Positano, offers solitude and quietness that echoes around its simple streets, whose peace is only broken by occasional villagers or donkeys laden with cargo which negotiate its steep staircases; no cars are possible in the village, and there are no roads. There is no piazza or town square, but a small grotto sits at the crossroad of pathways, above a simple church open only on Sundays – perhaps for visiting priests from other parishes. A notice on the doorway of a building suggests a monthly doctor’s surgery. All services and signs life are drawn from neighbouring towns – even the hamlet’s only restaurant is open from time to time. There is a small house which serves as a shop for essentials. A number of hotels and self-catering units provide ample accommodation in the hamlet, including the delightful Apartmenti Mario. A nightime arrival in Nocelle gives the visitor the sensation of Marco Polo arriving in an improbable city. Only upon awaking the next morning does the traveller understand where he has arrived, and why it was so difficult to get here: the road to Nocelle twists up from the main coastal route through the (slightly) larger village of Montepertuso, climbing through blind corners with sheer drops on one side. There is no street lighting; drivers stop their cars freely and randomly – this is still southern Italy, after all – and overtake other traffic playfully on treacherous corners, sometimes stopping for imperative chats with others along the way. Limited space for cars is available outside the village, and everything needs to be portered by foot into the village, along innumerable steps. Nocelle is a hard place to leave, practically speaking, and in any case, leaving this wonderful spot is an unwelcome thought. 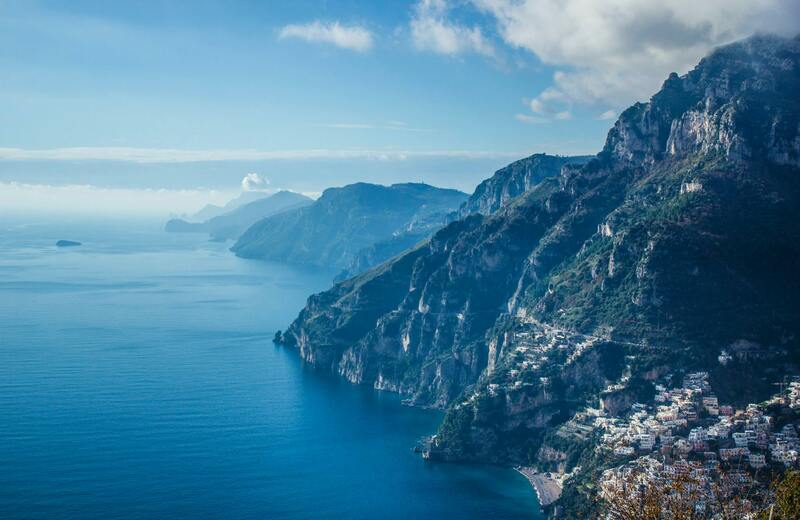 December in the Amalfi coast brings with it clarity and silence. Most of the tourist magnets are closed, and you will rarely find yourself in a crowd. Winter temperatures are chilly but pleasant, and the seasons bring daring red leaves along Nocelle’s walls, and often clear views of the cliffs all along the coast. At night-time the scene undresses to reveal a splendid moon, a brilliant Orion and occasional shooting stars. 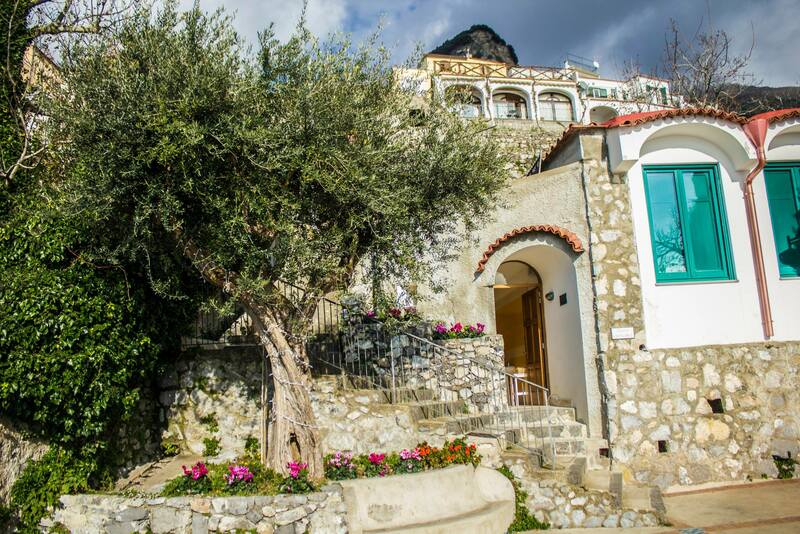 From Nocelle, a staircase leads down 1,700 steps to Positano, and another pathway starts at one side of the village: Sentiero degli Dei, the Pathway of the Gods, which leads eastwards high along the side of the mountain. 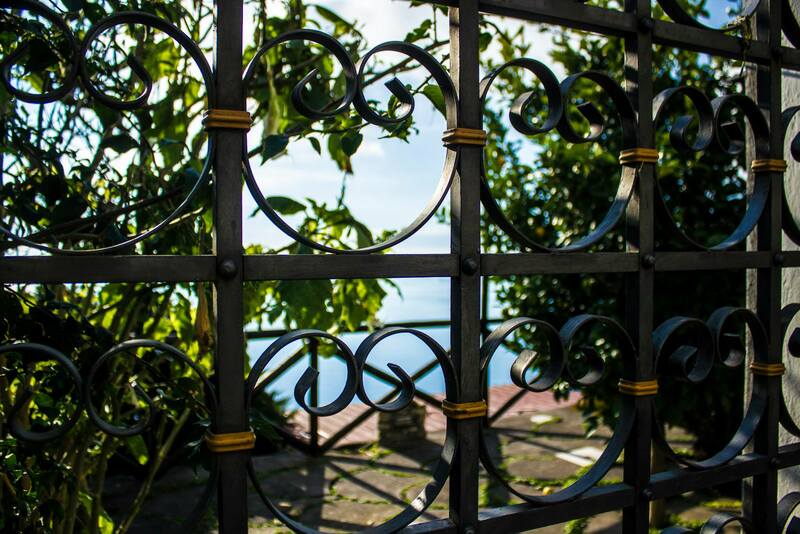 Walkers take down this 7 km path with an early morning start and it is possible to savour the nurturing silence of woods, olive trees, paths and crevasses, all along the way to Agerola near the town of Amalfi. Nearby in Montepertuso, an absolute gem of a restaurant, Il Ritrovo, run by Chef Salvatore, lavishes guests with attention and feels like the best kept secret on the coast. No sooner seated, the hospitality unfolds. Occasional surprises were brought to our table, including an unexpected serving of fragolino, a rare wine from Veneto strongly reminiscent of strawberries that can only be found in Campania (the grapes being illegal in most of Europe). 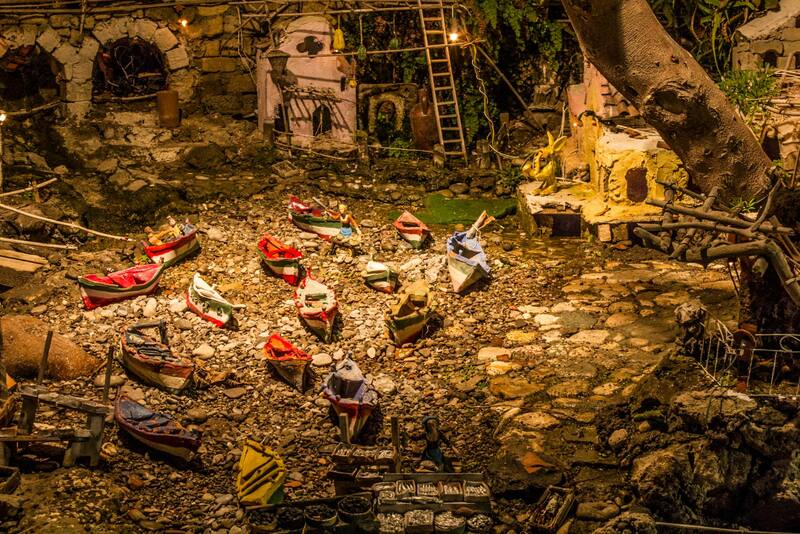 Underneath, on the shore, Positano is a place that lives on in many imaginations. It is more of an idea, really, than a town: entered by a one-way road that winds it way down endlessly from the coastal road, twisting and turning past hotels, boutiques and restaurants, the road keeps unfolding until, at what feels like its lowest point, you will find yourself at what might be the centre. 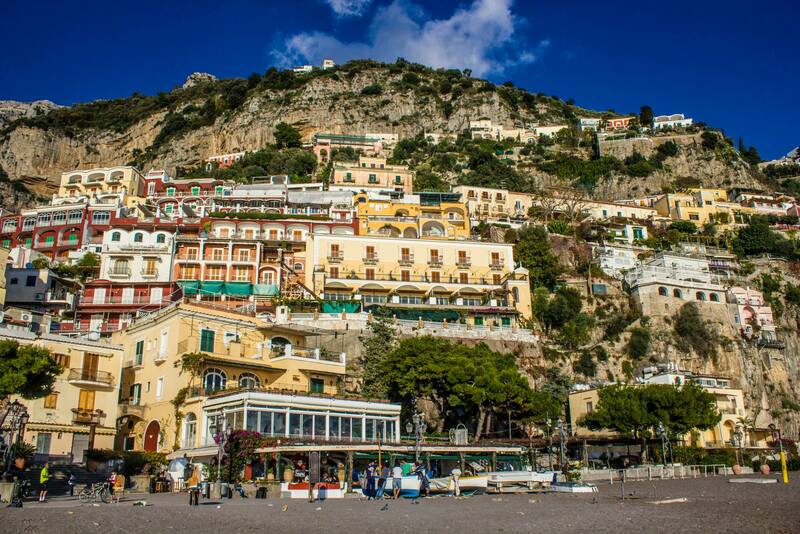 But there is no centre to Positano – one pathway leads to another, then to a ramp or to another staircase. Designer boutiques and restaurants, catering to the jetset crowd who inhabit the area in the summer months, invite you in and offer you their undivided attention. A little further ahead, the sea and from the coarse, pebbly, earth-coloured beach, the scene unfolds all by itself. In winter, this is a place of bright, chilly, dormant elegance, taking a brief rest before reawakening to come alive once more for a full, glorious summer. 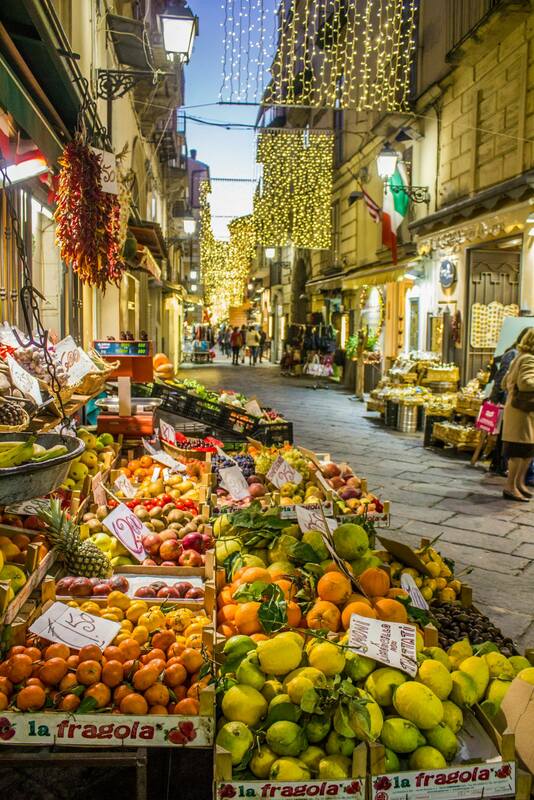 Lovely article depicting the magic of Amalfi Coast even in the winter months. Thank you for stopping by, Dan. Delighted you enjoyed it. Very nice. I was really able to imagine being there. A complete joy to read.